Recently, the Society was awarded a grant from the Delaware County Foundation’s Ron Sabatino Family Fund. The money received has been used to purchase a Network-attached Storage (NAS) system. A Network-attached Storage system is a data storage device connected to the DCHS network which provides real time access to the data, plus a convenient method of sharing files among multiple computers. In addition, DCHS can now take advantage of having its network extended to both the Meeker general office and the Cryder research library by backing up the data from Cryder to Meeker and vice versa, thus providing data security and getting a cost savings from not using a commercial cloud backup solution. 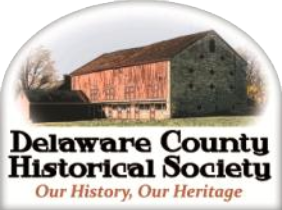 “We are pleased to award this grant that will modernize and expand the important backup infrastructure and ensure that the data entrusted to the Delaware County Historical Society will be preserved for future generations”, says Marlene Casini, president of the Delaware County Foundation. These stories, objects and photographs will “live forever”.